At Furumoto Dentistry, we're proud to provide world-class dental treatment in a welcoming, comfortable office environment. Our Diamond Bar dentists, Drs. Michael and Brent Furumoto, work hard to make dental treatment as effective and convenient as possible, designing personalized treatment plans that fit into your lifestyle. We offer a wide range of treatments at our office ranging from teeth whitening to dental implants, but we can also offer treatment for a problems beyond just the health of your teeth – including sleep apnea. Quality, restful sleep is critical for mental, bodily, and even dental health, but far too many adults don't get the quality or quantity of sleep that they need. In fact, many adults suffer from a sleep-related breathing disorder (SRBD) that robs them of restful sleep without even knowing it: obstructive sleep apnea, or OSA. OSA is a condition that causes recurrent episodes of reduced or interrupted respiratory airflow, severely disrupting normal sleep patterns. 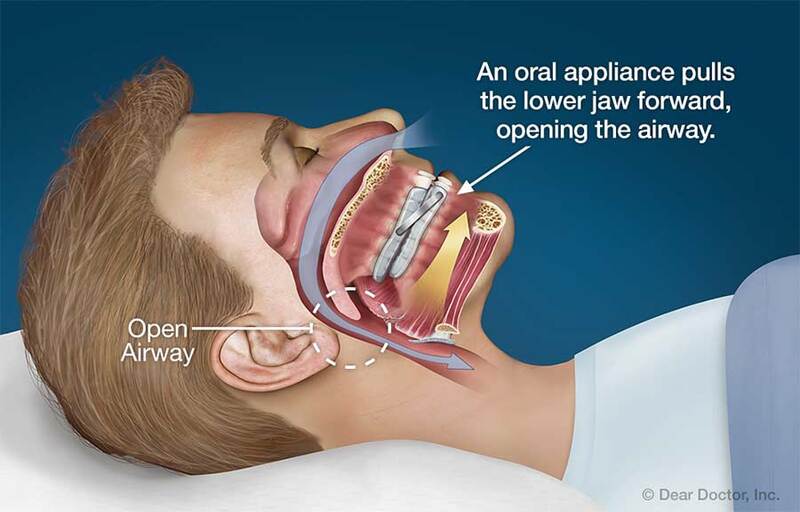 In obstructive sleep apnea, the soft tissues at the back of the throat relax too much during sleep, causing them to collapse, close the airway, and prevent breathing. Each individual episode of interrupted breathing is called an "apnea." Apneas can last from less than a second to up to 10 seconds long, and in severe cases of sleep apnea, they can occur up to 60 times per hour. During an apnea, your brain wakes up just enough to reopen the airway – and while it usually doesn't wake up enough for you to remember it in the morning, it does disrupt sleep. These partial awakenings are called "micro-arousals," and when they happen frequently enough, they can completely prevent the deep, restful sleep that our brains and bodies need to recharge. Sleep apnea isn't strictly a "dental" problem, but we can use dentistry to treat mild to moderate sleep apnea. More specifically, we can provide relief from sleep apnea through oral appliance therapy. Oral appliance therapy for sleep apnea involves using an oral appliance, similar to a night guard or retainer, that's designed to reposition the jaws, holding the lower jaw forward in the mouth. Moving the jaw forward like this opens up the back of the throat, creating a larger airway and preventing the soft tissues from collapsing and closing the throat. While appliance therapy won't work for extremely severe cases of sleep apnea, for the majority of patients it presents an effective, convenient alternative to CPAP machines. And if you think you may be suffering from sleep apnea, your Brea dentist can help! It's time to reclaim the restful, healthy sleep you deserve. Contact us today if you think you may be suffering from OSA or want to learn more about our sleep apnea treatments, or if you're ready to get started right away, simply request a consultation online. We can't wait to hear from you, and we look forward to helping you get a great night's sleep!